So, I’m not much of a planner. Well, not when I’m mucking about learning and having fun! In weaving terms, this means I sometimes have no idea how I want to finish my web. Maybe I’ll hemstitch, or maybe I’ll get some funky knot-work happening. The thing about this is, if I decide to hemstitch then, well…hemstitching is hell to do off the loom. Or, hell to get neat. My solution is to use scrap yarn (preferably a sticky one) to cinch together bunches of warp ends, before taking the web off the loom. Using a darning/yarn needle, I create running loops without going below the weft. The loops just wrap tightly around the warp ends. This keeps the weft in place and the warp ends tidy while you decide what finish you want/need. It also makes hemstitching off-loom work much better, because you only slide the loop of scrap yarn off a bunch of warp ends right before you stitch them. Gives a surprisingly neat hemstitch. Having had long hair pretty much my whole life, I’ve done my fair share of plaiting / braiding. 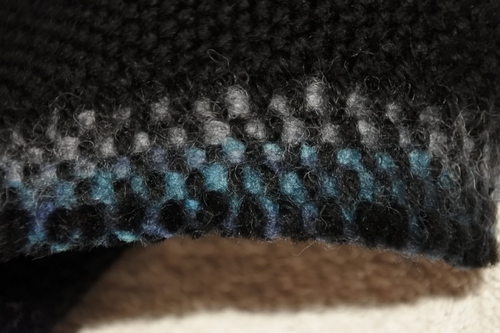 So, when it came to exploring different ways of finishing the edges on my weaving, I was pleased to discover how many of the edging techniques are just plaits. Of course you still have to do something with the ends so, unlike plaiting hair or friendship bands, it isn’t the whole process. Which is why most plaited edges belong to rug weaving. Aside from wanting an edge that will protect the cloth of the rug and help keep it in place, you have a definite ‘wrong side’ for all those ends to sew into! From my experiments so far, I can see definite uses for some of the edging techniques, but the time investment will also be a part of choosing to apply them. The more things I’ve woven the more I’ve found hemstitching frustrating. Mind you, also the more I’ve liked the end result! So the frustrating part is mostly working out which side to put the verticals on and which side the diagonals. Not a big deal for plain yarns but with variegated yarns and colour patterns you need to put some thought into it – sometimes even just giving it a go. Of course this means – often – that you’re not only doing the hemstitching “back to front” but “upside down” if you’re stitching the front edge of your web on the loom. Poor brain doesn’t much like this! However, a lovely tidy even hemstitched edge is kind of wonderful. Of the various joining methods for introducing new yarn, the one I guess that is most usual is to just overlap the ends a bit on the next pick of weft. I read a lovely old manual for a Schacht loom that talked about how best to do this and how important it was if you were entering your work in competitions! Apparently judges did/do judge harshly the “shadow” the slightly thicker weft makes at the point of overlap, so you were supposed to put it somewhere near the edge. Or somewhere inconspicuous I guess. Their advice was to overlap enough yarn that you could – after taking it off the loom – pull the ends through, leaving a much smaller overlap. After finishing, you then trim the ends as close to the fabric as possible. Now I’ve only tried this technique with knitting yarns, but I have to say it gives a nice result. I can imagine it working even better with finer thread. Is this the technique you’ve used? How do you join in new yarn when weaving? Well, there are a couple of different approaches. I thought I’d start by talking about a few options for joining at the edge. Obviously, if you’re going to cut something from the cloth, or you will sew the selvedge into the seam, then you could just leave tails sticking out – maybe trim them after the cloth is washed. If you want things neater than that, then you can do a knot. Alternatively you can weave the yarn ends parallel to the selvedge, with a needle. Nice and tidy. But what about for something like a scarf? Though leaving the ends hanging out is not the best choice for a scarf, I did do this with the soya yarn, as I figured it’d stay firmly in place as long as I trimmed it after washing. Seems to have worked! With some yarns, a good weaver’s knot right at the selvedge, is fine for a scarf. I’d sample with each yarn to test the result (including washing), just in case. Depending on the relative thickness / colour of your warp and weft, needle weaving it up the selvedge can be fairly invisible on a scarfs too. Of course, these aren’t the only options. More to come in future posts!